Cable Trench Foothill Ranch | Fiber Optic Installation CA | Underground Cable Ducting 92610 - Mark IV Communications, Inc.
Mark IV provides trenching services as a cost-effective means of burying telecommunications conduits, designed to carry fiber optic and feed cables from one building to another. 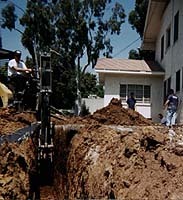 We ensure that all of the trench is at the required depth for installation of conduits, and each trench is properly filled and covered following installation. Our equipment is tailored, not only to meet trench width and depth requirements, but also the various soil and rock conditions that can be encountered during a project. At Mark IV Communications, we believe in providing our customers with complete, turn-key solutions, so whether your application is a campus environment or connecting the communications of two buildings to one another, we provide you with an affordable trenching solution. Contact us today to discuss your project.